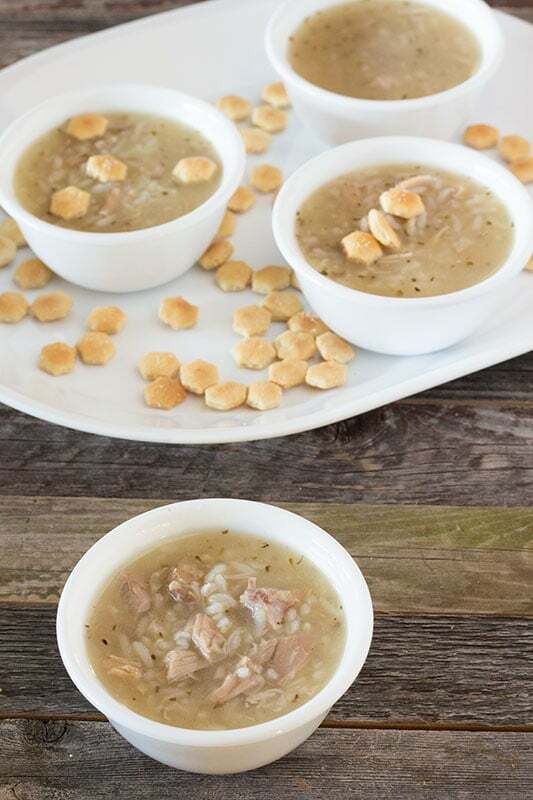 This turkey rice soup recipe can be made with a leftover turkey carcass or raw ground turkey. 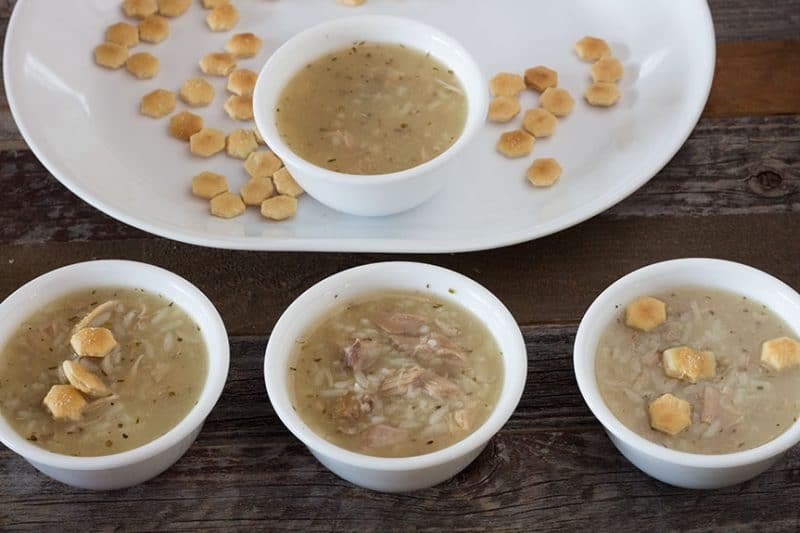 I know, most everyone has a turkey soup recipe that uses their leftover holiday turkey. This recipe is for those folks who do not have one and for those who would like to try a new version. This one also works with ground turkey if you happen to be one of the folks that were not lucky enough to have a spare turkey carcass hanging out. For me, the key to a good turkey rice soup is the choice is herbs used in the broth. My preferred herbs are rosemary, thyme, and marjoram. I use them in equal parts, but have learned over the years that a base started with a turkey carcass needs fewer herbs than a base started with ground turkey. Your base will be different too based on which way you start your soup. 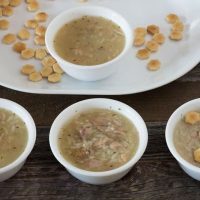 If you decide to go with a turkey carcass, you will need less soup base or bouillon, the roasted turkey skin and bones will provide quite a bit of flavor. In addition, I add my leftover turkey gravy. First off, we all know that gravy is kind of weird heated back up. Secondly, I hate to lose my pan drippings or the broth that I cooked my goblets in. I always cook my giblets in some chicken broth and use this to moisten my dressing while I am waiting on the turkey to give up some drippings. If you are starting with ground turkey, do not add the turkey until liquid is already superhot, otherwise, your turkey will kind of disintegrate and become the size of the meat crumbles in a fast food taco. Stir to break it in smaller chunks once it hits the hot water. Any chunks that are too large can be fished out, allowed to cool and crumbled by hand. I don’t like anything except rice and turkey in my soup, but if you want vegetables, they will be just fine. Add them after the turkey carcass has been removed from the pan. I do not use instant rice, nor do I use long grain rice. I use the boil-in-bag kind. It holds up the best during cooking and also during reheating of leftovers. Noodles can be used instead of rice. Turkey Rice Soup can be made with a turkey carcass or fresh ground turkey. Add chicken broth, turkey carcass, legs and thighs if not already eaten, and any leftover turkey gravy or pan drippings you have to a large stockpot. If using ground turkey do not add meat yet. Add enough water to cover the turkey carcass. Add the herbs to the pot, rubbing them between your palms prior to adding provides more flavor. Bring to a boil and add chicken bouillon. If using ground turkey, add it now, stirring occasionally to break up the meat. Reduce heat and simmer until the bones of the carcass begin to fall apart. If using ground turkey, let simmer for an hour or so. Place a strainer in a large bowl, this may take 2 bowls if there is a lot of broth, and pour liquid and bones into strainer. Set bones and meat aside until cool. Pour strained broth back into stockpot and bring back to a simmer. Add enough water to stock to make enough broth to make as much soup as you would like. Taste the broth and add additional chicken bouillon and/or herbs if stronger flavoring is desired. One bones and meat are cool enough to handle, separate edible meat from the bones and set aside. Discard bones, make sure there are no bones left in the meat. Be on the lookout for the really thin flat ones. Cut any large chunks of turkey into smaller pieces and all turkey to the broth. Bring broth back to a boil. Open the bags of rice and dump them directly into the soup. I start with 2 bags and increase the amount according to how much broth I have. I use about 1 bag for every 4 cups of liquid. Reduce heat to simmer and stir occasionally for 15 to 30 minutes or until rice is cooked through.